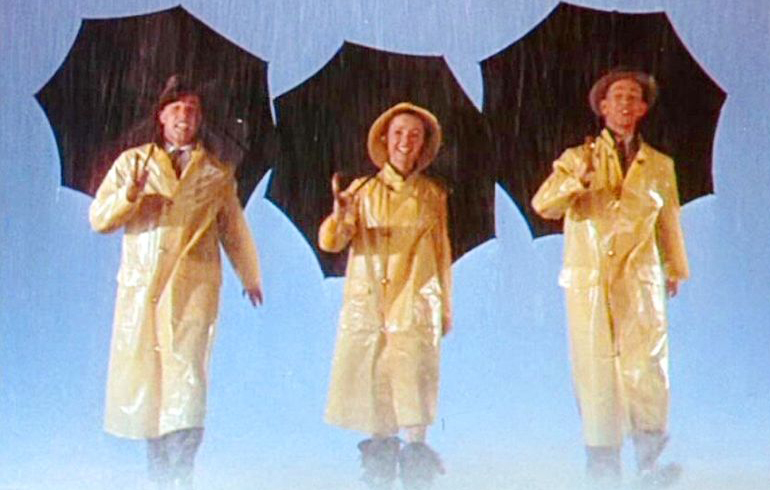 Gene Kelly, Debbie Reynolds, and Donald O’Connor in the 1952 movie, Singin’ in the Rain. Redlands, CA- Redlands Bowl Performing Arts (RBPA) is pleased to announce that Singin’ in the Rain has been selected as the musical for the 96th Season of the Redlands Bowl Summer Music Festival. The show will be directed by Nathan Prince and co-produced by Nathan Prince and Steve Simons of Legendary Productions, who previously directed and produced Oklahoma! at the Redlands Bowl in 2016. Performances will run Thursday, July 25-Sunday, July 28, 2019 with a public dress rehearsal on Tuesday, July 23, 2019. “In selecting a musical for the Bowl, we look for one that is family-friendly and captures the magic of Bowl. Singin’ in the Rain is a perfect Bowl musical! The score is timeless, and the tapping will be epic! This show will be fun for the whole family!” says Beverly Noerr, RBPA Executive Director. The “Greatest Movie Musical of All Time” was faithfully and lovingly adapted by Broadway legends, Betty Comden and Adolph Green, from their original award-winning screenplay in Singin’ in the Rain. Each unforgettable scene, song and dance is accounted for, including the show-stopping title number, complete with an onstage rainstorm! Hilarious situations, snappy dialogue and a hit-parade score of Hollywood standards make Singin’ in the Rain the perfect entertainment for any fan of the golden age of movie musicals. “We are thrilled to engage with Legendary Productions in bringing the ever-classic Singin’ in the Rain to the Redlands Bowl stage for the first time! With its unforgettable music, iconic dance scenes, and for the first time in Bowl history, actual rain onstage, it will be an amazing addition to the 2019 Redlands Bowl lineup. It’s a Broadway musical we’re sure Redlands Bowl audience members of all ages will love!” says Valerie Peister, RBPA Program Director. Filled with every memorable moment from the film and a downpour of unforgettable songs like, “Singin’ in the Rain,” “Good Morning,” “Make ‘em Laugh,” and more! “Anytime I have the chance to be involved in a classic such as this, I jump at the opportunity. I am even more excited and honored to partner with Nathan and Redlands Bowl Performing Arts on Singin’ in the Rain,” says Steve Simons, co-producer. “I see this show as a tribute to my mom who I lost this past year. Mom was in many of these original classic musicals and exposed me to them at a young age. I am so grateful for her and her legacy. This love for classic musicals was passed on to me and I passed it on to my kids. Now I get to pay it forward by producing this show at a venue founded on the idea of passing the arts on to the next generation. I am blessed,” continued Simons. Auditions will be held on Saturday, February 2, 2019 from 10:00 am – 3:00 pm and Sunday, February 3, 2019 from 12:00 am – 4:00 pm. Callback auditions will be on Sunday, February 10, 2019 from 10:00 am – 5:00 pm. Please email steve@legendaryproductionsclo.com for more information. Please come prepared to sing 32 bars of a song from the show if a lead role is desired, or song of choice from any show of the same genre if interested in an ensemble role. Dance will NOT be included in the initial audition but at call backs. Please come prepared with marked sheet music, a recent head shot, resume and a great attitude. Please go to legendaryproductionsclo.com/auditions for character breakdown and show information. Steve Simons and Nathan Prince are the founders of Legendary Productions which brings new Broadway shows, along with classic favorites, to the Inland Empire. Since founding Legendary productions in 2016, they have directed and produced A Charlie Brown Christmas, Little Women, Bye Bye Birdie, Much Ado About Nothing, and Twelve Angry Men. Redlands Bowl Performing Arts is the presenter of the Redlands Bowl Summer Music Festival which holds the distinction of being the longest continuously running music festival in the United States at which no admission is charged. The Redlands Bowl is attended by over 100,000 members of the public each summer. For more information, please go to www.redlandsbowl.org or call (909) 793-7316. Follow @redlandsbowl on Facebook, Instagram, and Twitter.